Giveaway & Taking Care of Your Best Accessory: Your Smile! — The Trendy Files - Fashion, beauty & lifestyle blog. I want to start this post off by disclaiming, I am no dentist or teeth specialist, I’m just someone who takes pride in taking care of my smile. So when Smile Brilliant reached out to do a collab, I was so down. Because a big smile is the perfect accessory or focal point to any look! Also if you follow me on Instagram (@TheTrendyFiles) you may have seen me post an unboxing of this toothbrush on my stories. If you haven’t heard of Smile Brilliant before, let me quickly give your the 411 on who they are. Side note: Does anyone use the term 411 anymore or is that so 2002? Anyways, Smile Brilliant was founded by dental professionals and focuses on teeth whitening. 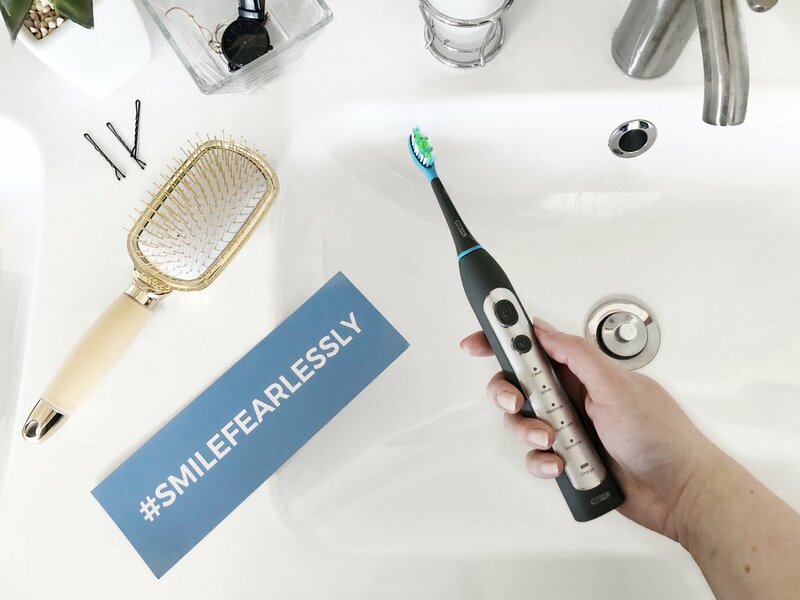 It started off with teeth whitening kits and now offers electric toothbrushes - which is what I’m going to be telling you about now! The newest product to hit Smile Brilliant’s line, is its cariPRO Ultrasonic Electric Toothbrush. Now before I go into the details about the toothbrush let’s backtrack a bit and I’ll take you through my electric toothbrush history. Now the cariPRO is the first “real” electric toothbrush I’ve use. I once got a cheap battery powered electric toothbrush from the drugstore about 10 years ago, but that phase didn’t last very long. So this is my first experience with a real good electric toothbrush, which I have to say has actually changed my toothbrushing game forever! I brush my teeth twice a day, when I get up not-so-wide-awake around 6:15am and when I’m just about to roll into bed around the 9:30pm mark. For my weekday mornings I like to keep my “get ready” routine to under 15 minutes, but brushing my teeth is the one thing I take my time with. The cariPRO is way more sophisticated than that cheap electric toothbrush I once tried to use and my regular $2 soft toothbrush. There are five modes to help you customize your teethbrushing experience: Clean, White, Massage, Gum Care, and Sensitive. I’ve tried out all the modes, but I find I alternate between the clean, white, and gum care mode. Each mode runs for 2 minutes and has four 30 second intervals to help you make sure you spend enough time on each section of your smile. The toothbrush has a small charging station. A full battery charge takes about a day and that fully charged battery will last up to about 30 days. The biggest difference I’ve noticed is how my teeth feel after I use this brush. I’ve been using this brush for about two weeks now and it still surprises me how clean they feel after I brush them. It’s also just makes me feel great when I feel confident about my smile. Because like I said at the beginning of this post, your smile is your best accessory! Want to win your own cariPRO electric toothbrush? Go to the link below and fill out the form to enter to win an $119 Smile Brilliant credit (price of toothbrush)!